BTT is now using Apple's "Hardened Runtime" on macOS and is notarized using the Apple notarization service. Keyboard Shortcuts & Key Sequences can now be bound to a specific keyboard type. Fixed "New File in Current Folder" action. Added a pretty cool but experimental predefined action: "Save / restore specific window layout". This allows you to save various window sizes & positions among different apps, and restore them at any time. This may not work in call cases yet, please report issues on community.folivora.ai if necessary. Added predefined actions "Save current window layout" & "Restore last saved window layout"
Added a "Toggle Display Mirroring" action. Fixed issue with conditional activation groups and keyboard shortcuts. Added two new triggers to the "Other" tab: "Conditional Activation Group Activated" and "Conditional Activation Group Deactivated". 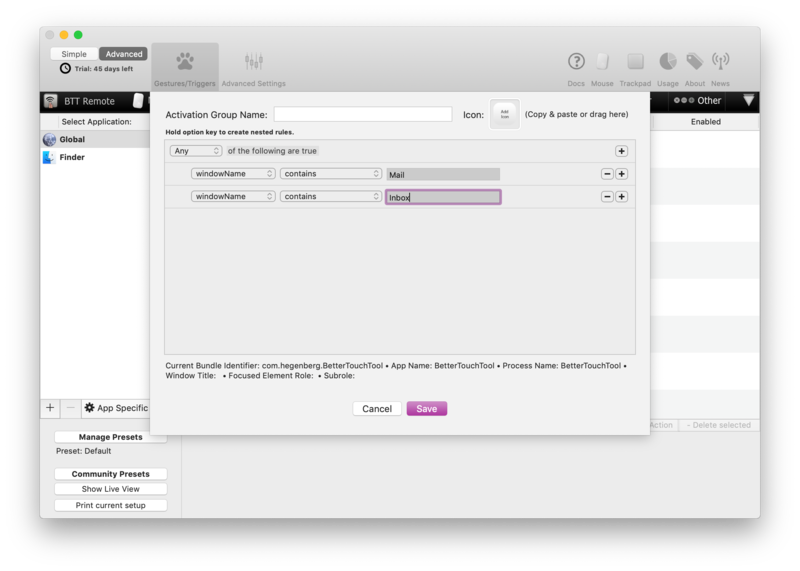 This allows you to trigger stuff when one of your activation groups becomes active / inactive. Conditional activation groups now offer some variables as condition. The variables can be set using Apple Script (e.g. Fixed issue with sub roles in conditional activation groups. Possibly fixed an issue with conditional activation group scopes and with the old keyboard implementation. UI is still not completely finished...! Added a "always show" option to the Touch Bar modifier options. When using that, the button will completely ignore any other modifier settings and always show. Fixed an issue with app specific triggers and modifier keys. The new UI is not yet included - soon! This should signficantly reduce average cpu consumption when using Touch Bar stuff. Conditional activation groups can now trigger based on the currently open Touch Bar group. Fixed an issue with Trial versions that expired too soon. Added "display order" to the Touch Bar item configuration options. This allows you to define the order in which items will appear if they are merged e.g. from different activation groups. This should fix an issue where BTT wouldn't work correctly after waking from long sleep on macOS Mojave. News: I'm currently spending most of my time implementing a completely new user interface. If you want to join the discussion, have a look at https://community.folivora.ai/t/new-bettertouchtool-ui-progress/4261. I plan to release the new interface in 4-8 weeks (it will be optional at the beginning). Some more improvements for macOS Mojave, especially relating to Dark Mode, but also other areas. Fixed various bugs in the "Normal Mouse Tab"
Improved compatibility with macOS Mojave, which was released today. A small recovery update to fix an issue introduced in BTT 2.618 that could lead to unresponsive shortcuts in some situations. Added a native "Now Playing" widget for the Touch Bar. Summary: This new version is quite powerful, it contains many improvements for the Touch Bar, a new feature called Conditional Activation Groups and various stability & performance improvements. 2.606 is a quick recovery update that includes a fix related to the shell script widgets. Note: to make BTT more flexible it is now using a custom Touch Bar button implementation, unfortunately in some cases this may change the margins you have previously defined. Also this version completely changes the data model for the Touch Bar stuff, in case you run into any issues please report them. New native "now playing" widget. (For iTunes, Spotify, Safari and others). Touch Bar haptic feedback can now trigger when touching AND when the action is triggered, which feels much nicer. Weather and Time/Date widget can now use "System Defaults" for units and timezone. Emoji Widget is now just one endless scrolling list that should behave much faster. Most used emoji are sorted first. Emoji Widget now allows you to define your favorites. Touch Bar items are now cached completely after they have been shown once. This slightly increases RAM usage but improves CPU usage and responsiveness. Users have shared some AMAZING Touch Bar presets on community.folivora.ai. One of the most complete and powerful is the preset by user GoldenChaos, but there are also many others. I definitely recommend to have a look there and see whether you like any of them! Fixed an issue that could cause multiple items in BTT to have the same UUID. This had previously led to very weird behavior in some cases. This version may change the UUID of some of your items to fix this. Haptic feedback on Mojave is now the same as on High Sierra again. Various little fixes and improvements for macOS Mojave. Added option to match for "executable path" in the new conditional activation groups. Improved first start experience by reducing the number of popups. BTT now uses a separate database file for every new version, so downgrading will be easier in the future. This version of BTT cleans up the BTT folder in ~/Library/Application Support/BetterTouchTool and creates a zip file containing various backups. Touch Bar groups can now be configured to "Keep open while switching between apps"
New community forum: https://community.folivora.ai and connected preset sharing service (beta) https://share.folivora.ai. This should fix a long standing issue that caused window snapping to behave incorrectly for some apps (e.g. Firefox, Slack) if a screen reader or an app that emulates a screen reader was active. Fixed compatibility with some apps that couldn't be recognized in BTT before. These problematic apps need to be added to the list of BTT's apps by selecting them from the "List of running apps"
Added predefined actions "Show HUD Overlay" and "Perform Haptic Feedback"
Slider widgets now trigger their assigned action when sliding them. Many internal changes and bugfixes. Fixed a few issues with scripting BTT. Fixed various import & export related things. Apple Script actions & widgets can now use either standard Apple Script or Java Script for Automation. Hopefully fixed an issue with keyboard shortcuts when switching between Secure Input mode and normal mode. Improved app-specific Touch Bar showing/hiding behavior. About screen shows how long the registered license will receive free updates. Added Touch Bar Gestures: Two Finger Swipes, Three Finger Swipes and Four Finger Swipes. They can easily replace some brightness / volume sliders. Just assign the predefined actions "Volume Up/Down" or "Brightness Up/Down". See the documentation for more info. Added option to repeat assigned actions for Touchpad & Magic Mouse Gestures while there are still fingers touching the trackpad after triggering the gesture (see https://docs.bettertouchtool.net/docs/magic_mouse_trackpad.html). Added a "visible checkbox" to the Touch Bar tab. This allows you to temporarily disable/hide Touch Bar items. It also allows you to hide Touch Bar Groups that you only want to open using the predefined action "Open Touch Bar Group"
The JSON Import/Export can now also include all general preferences (optional). Improved the "Other" tab in BTT. Fixed an issue with Dropbox Sync. Fixed an issue where Apple or Shell Scripts assigned to a Touch Bar widget would trigger twice in some cases. Added the most powerful window resizing action ever. It's called Custom Move/Resize Window and it can basically resize and move your windows to any position on any of your screens. It should allow for almost all use cases and is highly customizable. (e.g. if you want an action to move windows between monitors - that's the one for you). In case it doesn't cover your use case - please let me know and I'll check if I can support it. Added predefined action "Paste specific items from Clipboard Manager", which can be useful in some cases. Fixed issue with very low resolutions. Fixed issue with recording drawing gestures. You can now set a shared secret that must be passed whenever one of the scripting functions is used. This can be set in the advanced preferences. Other Triggers: You can now specify "named triggers" in the other tab in BetterTouchTool. These can be triggered using the predefined action "Trigger Named Trigger". TouchBar: Repeat Rate & Repeat Delay when keeping a button pressed can now be set. TouchBar: Option to trigger a "named trigger" on long-press of a button or widget. Predefined actions: The Move mouse to position action is now much more powerful. It e.g. allows you to move the mouse relative to the default button, relative to all window corners or to the active element in a window. 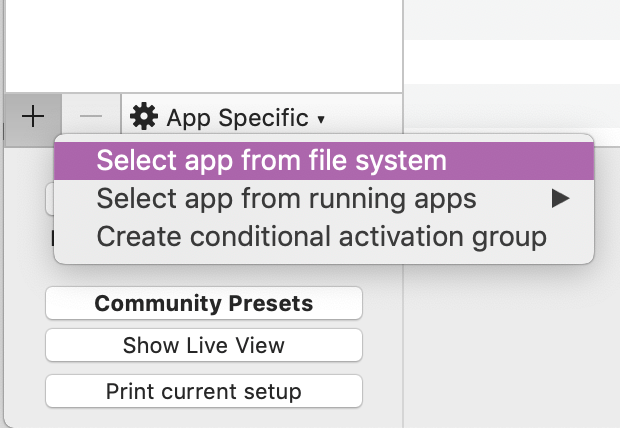 Predefined actions: Added predefined action "quit application under cursor"
Predefined actions: Fixed issue with "Show Menubar in Context Menu"
General: Added integrated Webserver (disabled by default). This allows you to create super customizable HTML based dashboards (e.g. for use on tablets or android phones). Also it is great in combination with the new floating menu action. General: Completely changed the Apple Script runner service to use significantly lower amounts of memory. Other Triggers: Fixed issue with "Double-Click Window Titlebar" trigger. Tons of little fixes, many keyboard related but also other. Added predefined actions "move window to desktop 1-16", "move to desktop 1-16". BetterTouchTool now auto-detects when macOS Secure Input is active and changes the shortcut handling to continue working in a "limited mode" (the new fn based keyboard shortcuts will not work in that mode). Complete rewrite of the keyboard functionality in BTT. You can now use the function key in keyboard shortcuts. You can now create separate shortcuts for left and right modifier keys (click the little cog icon on the left of the shortcut field and select "Differentiate between left and right modifiers". For example you could says "right cmd + space => do something fancy" while keeping left cmd + space for spotlight. The trigger on down and key repeat stuff should work better. In case you encounter problems, the old shortcut implementation can be activated in the advanced preferences. The custom click action can now send mouse down / up events separately so you can e.g. define a keyboard shortcut to trigger a middle-mouse-down on key-down and a middle-mouse-up on key-up. Fixed issue that caused Preset export to not work correctly on some systems. Fixed issue with "Trigger only when touching dock" / "not touching dock" options. Fixed an issue with the shell script widget that prevented running binaries without parameters. Fixed issue with "move mouse to corner" action. Fixed issue with keyboard shortcuts that trigger other keyboard shortcuts when configured to trigger on "key-down"
Improved Snap Area performance by only showing the snap areas of the monitor that displays the mouse cursor. Sorry, a small recovery update. v2.331 could crash in some certain edge case when Touch Bar widgets were being used. Added a new Touch Bar Widget "Run Shell Script and Show Return Value". In many scenarios this will be much more performant than the Apple Script widget as it can run multiple scripts/tasks/commnands in parallel. It can be combined with the new predefined action "Execute Shell Script / Task". Chris Lennon has created a really great webapp that allows you to automatically create BTT Touch Bar widgets which show you your favorite crypto coin values. It's available via https://chrislennon.github.io/Crypto-Touchbar-App/ and will be updated very soon to use this new widget. Added caching for Touch Bar widgets to reduce visible resizing movements. Added option to change Touch Bar font size in the general settings. Touch Bar items now use a mono-spaced font by default to prevent jumping (can be disabled in the general Touch Bar settings). Fixed an issue that caused the Apple Script widget to execute repeadedly although the repeat slider was set to 0. Fixed JSON import issue where application specific options where not imported correctly. Improved BTT launch time on some machines. Trying to workaround a macOS bug that causes BTT to crash on some machines when connecting bluetooth devices. Added workaround for Chrome v61 / macOS bug that could cause missed left-clicks in Chrome. Added a customizable Apple Script Slider Widget for Touch Bar. Added predefined action "Open Touch Bar Group With Name"
Added option to Touch Bar settings to choose whether icons will be scaled keeping the original ratio or not. Removed Leap Motion support for now (it wasn't working anymore anyways and I need to focus on the more popular parts in BTT). Maybe this will come back with future versions. If you still rely on it, please don't update to this version. Removed experimental Wacom tablet support due to issues on High Sierra. This will come back with a future update. If drawing gestures are defined per application but not globally, the feature will be completely disabled unless that app is active. Added new trigger to "Other" section: After Launching on Mac with Serial Number". This let's you e.g. switch presets specific to a machine after starting BTT on that machine. Added advanced setting to keyboard shortcuts "Prevent recursive triggers". This should prevent BTT from triggering itself by a action sent with BTT. Fixed issue where BTT Touch Bar would show after starting BTT, even if it was hidden before. Added Predefined Action "Activate/Bring to Front Window Under Cursor"
Fixed issue with the "Show/Hide Specific Application" Predefined Action. When adding a new application you can now choose from a list of running apps - this allows to e.g. add Java apps that come with a special launcher. Previously it was not possible to add such apps. Custom 4 Finger Tap Sequences can now be excluded from thumb/palm handling (in the advanced preferences). This is necessary if you want to use your thumb in such a gesture. This is a small but important bugfix update. There will be a bigger update by the end of the month! Improved "Show Clipboard/Pasteboard History", the Clipboard Manager should now work much better and with all apps. I'm currently a bit slow on replying to e-mails and Github issues (Too much work). I still read every issue and email you create, so please continue sending feature requests and bug reports. I'll soon have more time to work on BTT again. Complete rewrite of the "Show Clipboard/Pasteboard History" predefined action. Should be much more performant and powerful now. Fixed various other bugs & performance issues. Snap areas should be faster to display. Some improvements and fixes for the new Show Clipboard / Pasteboard History predefined action. Fixed a bug with the "Restore Saved Mouse Position" action. Added a great new predefined action: "Show Clipboard/Pasteboard History". Basically it keeps a history of your clipboard and allows you to access it at any time. If you haven't used another clipboard management tool yet I highly recommend to try this, it has really improved my efficiency by a lot. It's probably not as powerful as other specialized clipboard management tools out there, but it has some features I was missing with other tools. It's disabled by default, you need to assign the "Show Clipboard / Pasteboard History" action to some trigger (e.g. Gesture or Keyboard Shortcut). You can paste multiple at the same time by selecting them while holding CMD. Moved Touch Bar Apple Scripts and background Apple Scripts to a separate process, this should also solve various crashing issues. Completely threw away the previous thumb recognition algorithm and replaced it with something new. Let's see how this works on different systems. This should fix most small bugs that have been reported since the 2.10 release. Thank you for installing all the updates! While there was a long beta phase - the 2.10 release was very big and some edge cases always only appear in real-world testing. If you encounter any bug, please let me know here: github.com/fifafu/BetterTouchTool. This is internally a very big update. It completely changes the BetterTouchTool data model in order to support syncing to multiple machines (e.g. via Dropbox). The sync functionality is not yet enabled in this version, but will be very soon if everything goes well. This version migrates your previous BetterTouchTool data file to the new format, you shouldn't notice this migration. In case anything goes wrong during the data migration: don't worry. BTT automatically creates backups. Please contact me in case anything goes wrong (best via Github). Completely new Preset system. Presets are now exported and imported as JSON (thus they can e.g. be edited in a text editor if necessary). You can now have multiple presets enabled at the same time, one of them has to be selected as master preset. Completely changed the "Switch to Preset" predefined action in order to support the new preset system. Copy & Paste is now also JSON based. You can paste between different presets and even to other apps. Added predefined action "Volume Up (Small Step)" and "Volume Down (Small Step)"
Added predefined action "Toggle Dark Mode"
Added predefined action "Toggle Do Not Disturb On/Off"
Added predefined action "Toggle Night Shift (experimental, requires macOS 10.12.4)"
Added predefined action "Add New Space To Mission Control"
Added predefined action "Run Apple Script in background"
Added a new mode for pasting/inserting custom text. You can now choose between "pasting" and "typing", depending on the use case one might be faster than the other. Window snapping has now a "High Performance Mode" which can be activated in the advanced preferences. It significantly increases the performance of the window snapping animation, but also significantly increases the memory usage of BTT. The Touch Bar brightness slider uses a different API and shouldn't be dimmed back by the system anymore. The Apple Script widget now allows to run Apple Scripts which only update the widget by pressing it. To achieve this, assign the "Run Apple Script (enter directly as text)" predefined action. (You can leave the script field in the widget settings empty if you don't need timer based updates). You can now set a minimum movement that is required before starting to recognize right-click drawings. Drawing gestures should now only be recognized while being drawn with approximately the rotation they were recorded with (can be changed in the advanced settings). Fixed various bugs with the drawings feature UI. Signed with a new Apple Developer certificate because my old one has expired recently. Please report any issue you encounter via Github: http://github.com/fifafu/BetterTouchTool. Sorry another small bugfix update. Fixes the lock screen action. There have been many internal changes recently, if you encounter any issue, please let me know here: github.com/fifafu/BetterTouchTool. This version contains small but important bugfixes. There have been many internal changes, if you encounter any issue, please let me know here: github.com/fifafu/BetterTouchTool. Custom drawing gestures can now be drawn by holding down the right mouse button (or two fingers on a trackpad). This currently only works on Sierra. Note: Straight lines are currently not supported by the algorithm used, currently your drawings need to include at least one curve or corner. Sorry, one more small update to prevent a bug that could lead to Touch Bar crashes. Also improved Tip Taps: Added a slider to the advanced Trackpad preferences that lets you adjust the maximum distance fingers can be apart from each other for them to be still recognized as Tip Taps. Touch Bar Support. BetterTouchTool now allows you to completely customize the Touch Bar on the new MBP for any app you have installed. Support for the new MBP's trackpad. I'm moving to GitHub for issue/feature/idea/question tracking: github.com/fifafu/BetterTouchTool. You can now repeat an action while a mouse button is pressed (click the little gear icon left to the mouse button selection). Added key repeat functionality to keyboard shortcuts (click the little gear icon next to the shortcut recorder field). This allows you to repeat an action in a specific interval while the shortcut keys are pressed. Added new predefined action to toggle hide/show a specific application. The predefined action is called "Show/Hide Specific Application"
You can now specifiy that a shortcut should already trigger on "key-down" (default is on "key-up"). This can also be done by pressing the little gear icon next to the shortcut recorder field. Added a few new haptic feedback options that use a better API for generating Force Touch feedback. You can configure the feedback in the Advanced Settings => Trackpad => Force Touchpad. The defaults may change soon. Improved drag to top Mission Control delay (while maximizing windows, it often happened that Mission Control showed up. It now requires more "force" to bring up Mission Control.). This can be disabled in Adanvced Settings =>Window Snapping => "El capitan: Delay Mission Control on top edge". Added predefined action "Open Active/Selected Folder With Specific App" (this let's you e.g. open the Terminal app at your currently selected folder in Finder. This update adds compatibility with the new macOS 10.12 Sierra which will be released on tuesday. Added a usage view to the preferences window, which lets you visualize your BetterTouchTool usage (this will be improved over time). This is just a very small bugfix update for BetterTouchTool. A bigger update will come later this month. Improved the Key Sequence recording screen. Added cool new feature: "Key Sequences". Key Sequences allow you to trigger any BetterTouchTool action by typing arbitrary sequences of keys (e.g. CMD+CMD+OPT or H E L L O SHIFT). This feature is completely new and will be improved over time. Like normal keyboard shortcuts Key Sequences can be added in the "Keyboard" tab in BTT. Improved the "Paste Custom Text" predefined action (can be combined with Key Sequences to replace typed text with something else). Added new Predefined Action "Run Apple Script (enter directly as text)" which includes a nice Apple Script editor and allows you to enter & save the script inside BTT. Added middle-click option to the window button actions in the "Other" tab. Fixed issue where the Siri Remote wouldn't reconnect after the Mac woke from sleep sometimes. Fixed many potential performance issues. Fixed an issue where Four and Five Finger Pinches would also trigger Four / Five Finger Swipes. I'm currently working on a completely new documentation for BetterTouchTool, it will be available via http://docs.bettertouchtool.com. I hope it will be more or less complete by the end of May! Fixed an issue where window snapping wouldn't work correctly on OS X 10.11.4 in some situations / configurations. Added the Custom Snap Area feature which was previously only available in BetterSnapTool. It allows you to define your own custom snapping areas (and therefore resize windows to any position/size you want). They can be triggered like the normal window snapping feature, but also via gestures and shortcuts. New snap areas can be created by clicking the BetterTouchTool menubar icon and going through the Snap Area menu. This version fixes a possible man-in-the-middle security issue with the popular Sparkle auto-updater that is also used in BetterTouchTool (https://sparkle-project.org/). Make sure to also update all your other Mac applications that use Sparkle to the latest version! Added many more Siri Remote tap & click options. In mouse mode you can now right-click when tapping the right edge of the trackpad. The transition to a paid app is going really well, thanks a lot to all early buyers and to the great BTT community in general! This update completes the switch to the paid model announced ~two weeks ago. After updating BTT will be in trial mode for 45 days and you can decide whether you want to buy it. All other versions will expire in about two weeks. Thanks a lot for the incredibly great feedback!!! Added basic scrolling to Siri Remote. Click the remote's trackpad to scroll. Added some information about the upcoming switch to a "Pay what you want" model. Fixed the custom drawings tab in BTT (for custom mouse gestures). It was broken and didn't display the drawings in the tableview. Triggering menubar items or context menu items now allows for wildcards * (for items that have variable names). 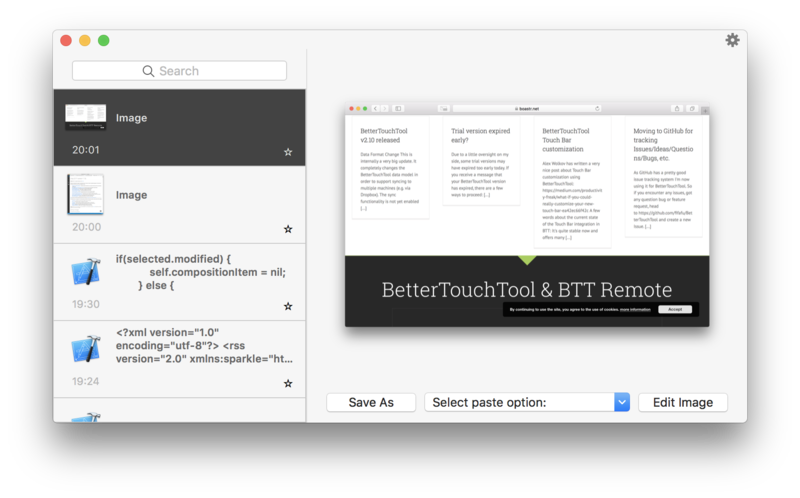 BetterTouchTool now supports the new Apple TV Remote (aka Siri Remote). You can pair it with your Mac via Bluetooth (4.0). Mouse Control Mode for the Siri Remote trackpad, you can move your mouse, tap to click or double-tap to drag. As Apple sells the Siri Remote separately from the Apple TV, this is pretty cool, finally a good Mac remote! Small bugfix update. E.g. fixes an issue with two finger click gestures on Force Touchpads. There will be a bigger update with various Force Touch improvements in about 1-2 weeks. Fixed Touchpad Mode on Magic Mouse. If you want to define different gestures for different trackpad types you can now do this by right-clicking a gesture or by clicking the little gear icon next to the gesture selection. I reactivated my blog on http://bettertouchtool.com and will now again regularly post there.